While Hollywood loves its war stories, theatre and the military have traditionally made uncomfortable bedfellows, if they’ve even got past first base at all. That began to change, certainly on the Fringe, after the invasion of Iraq. Over the past five years, the military drama has rather begun to dominate Fringe schedules, whether as realist verbatim theatre, or as an abstracted, imaginative response. Both approaches bring different but equally large responsibilities to their subjects. Somewhere between both of these lurks Kursk, a new immersive multimedia piece by BAC-affilliated theatre company Sound & Fury. As the title indicates, the play deals with the sinking of the Russian submarine Kursk in 2000, a tragedy in which everyone on board died. 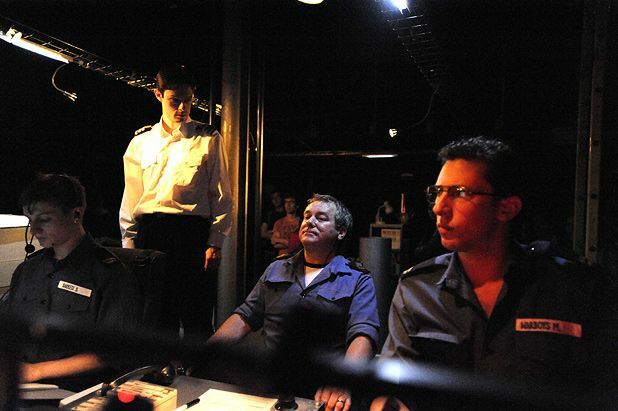 Although the company have filtered the event through the eyes of a fictional British submarine crew keeping tabs on the Russians, they’ve tried to create as realistic an experience for the audience as possible. The company were also given access to Royal Navy submarines, which their designer has tried to replicate in the Drill Hall. Kursk, The University of Edinburgh Drill Hall, 556 6550, 20–29 Aug, 10.30pm, £8.50–£9.50 (£7.50–£8.50). In collaboration with Bryony Lavery. On the fraying front-line of the cold war a submarine is on patrol silently shadowing its target. Inspired by the Russian submarine disaster of August 2000.